Brie melts when you look at it! It’s just a super sensitive cheese, ya know? And it pairs with roasted crispy vinegar-y mushrooms like you wouldn’t believe. All I’m saying is, make this omelet right away. 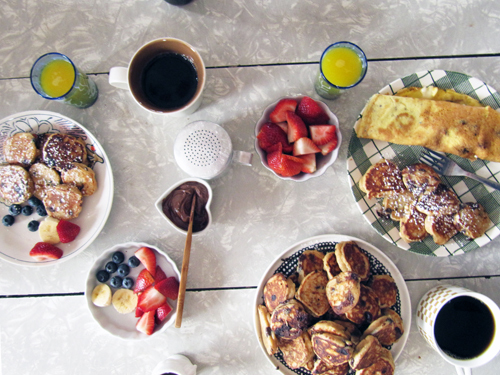 Have it for breakfast, brunch, lunch, dinner, whenever, but mostly just make it. Take one bite and put your hands over your heart in an “I’d marry this omelet if it was the commitment type,” way. It’s ok to get sentimental about a cheese, right? I hope so, anyhow. Preheat your oven to 425F. Line a baking sheet with foil. Toss sliced mushrooms with olive oil, salt, pepper, garlic, and red pepper flakes. Roast for 10 minutes, toss with a spatula, and roast for 10-15 more minutes or until dark and crispy. Remove from the oven and toss mushrooms with vinegar and rosemary. Wrap up in foil until time to fill the omelets. 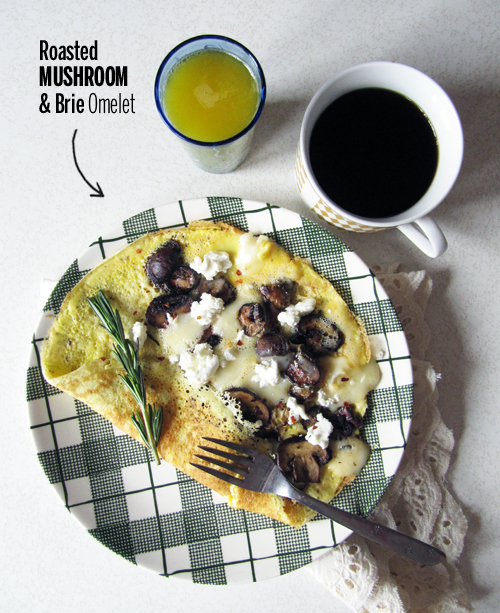 Make 1 omelet at a time by beating 2 eggs with salt and pepper and a teaspoon of milk until foamy. Meanwhile heat a greased skillet over medium heat. 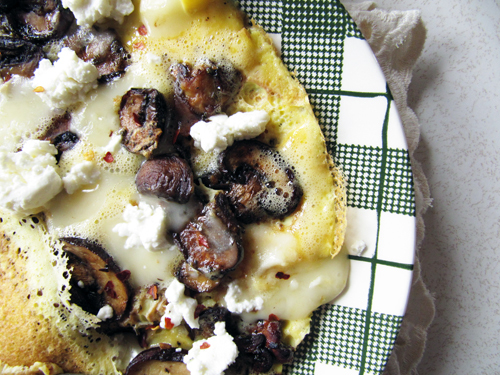 Pour beaten eggs in the warm pan and sprinkle half of the omelet with half of the mushrooms, brie, and crumbled goat cheese. Once the eggs are set, fold over. Repeat to make the second omelet. Sprinkle with red pepper flakes to taste. Oh man, looks too freaking good. Love mushrooms and cheese, but Brie is especially yummy. Ok, you convinced me. I’ll have this for breakfast. Yes! You’ll love it, I bet. I’d marry that omelet too. So perty and delicious looking! Yeah girl! Worth loving for real! it’s always appropriate to get emotional about cheese! it’s jsut so emo, you can’t help it! Brie is the best cheese, I think. These make me sad that I used the last of our eggs in madeleines.